AYREY, R. F. 2018. A New Species of Vaejovis from the Patagonia Mountains, Southern Arizona (Scorpiones: Vaejovidae). Euscorpius, 262: 1-12. SOLEGLAD, M. E., R. F. AYREY, M. R. GRAHAM & V. FET, 2017. Catalinia, a new Scorpion genus from Southern California, USA and Northern Baja California, Mexico (Scorpiones: Vaejovidae). Euscorpius, 251: 1-67. AYREY, R. F. 2017. Serradigitus miscionei, the First Vaejovid Scorpion to Exhibit Parthenogenesis Euscorpius, 241: 1-7. AYREY, R. F. & M. E. Soleglad. 2017. A New Species of the "apacheanus" Group of Genus Pseudouroctonus from Western Texas (Scorpiones: Vaejovidae). Euscorpius, 237: 1-23. SOLEGLAD, M. E., V. FET, M. R. GRAHAM & R. F. AYREY, 2016. Graemeloweus, a new genus from Northern California, USA (Scorpiones: Vaejovidae). Euscorpius, 227: 1-37. AYREY, R. F. 2016. Pseudouroctonus peccatum, Tate, et al,. 2013, Rediscovered. Euscorpius, 214: 1-5. AYREY, R. F. & M. E. Soleglad. 2015. New Analysis of the Genus Pseudouroctonus with the Description of Two New Species (Scorpiones: Vaejovidae). Euscorpius, 211: 1-55. AYREY, R. F. & M. E. Soleglad. 2015. New species of Vaejovis from the Whetstone Mountains, southern Arizona (Scorpiones: Vaejovidae). Euscorpius, 194: 1-14. AYREY, R. F. 2014. 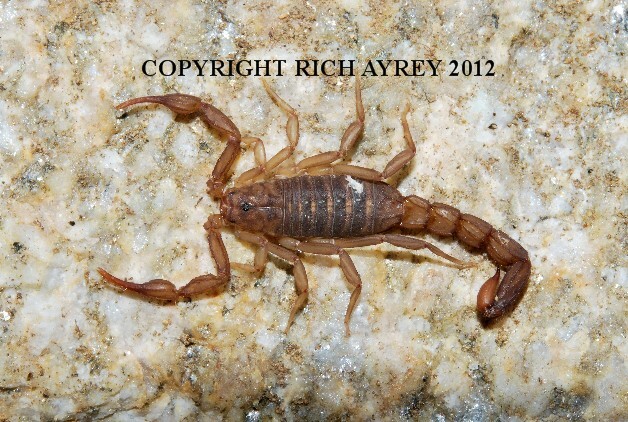 A New Species of Vaejovis from chaparral habitat near Yarnell, Arizona (Scorpiones: Vaejovidae). Euscorpius, 188: 1-13. AYREY, R. F. & M. E. SOLEGLAD. 2014. New Species of Vaejovis from the Santa Rita Mountains, Southern Arizona (Scorpiones: Vaejovidae). Euscorpius, 183: 1-13. AYREY, R. F. 2013b. A New Species of Vaejovis from the Mogollon Rim of Northern Arizona (Scorpiones: Vaejovidae). Euscorpius, 176: 1-13. AYREY, R. F. 2013a. Reproduction and Birth in the Vorhiesi Group of the Genus Vaejovis (Scorpiones: Vaejovidae). Part I. Clutch Size Euscorpius, 166: 1-15. AYREY, R. F. & M. M. WEBBER. 2013. A new Vaejovis C. L. Koch, 1836, the second knowm vorhiesi group species from the Santa Catalina Mountains of Arizona (Scorpiones: Vaejovidae). Zookeys 270: 21-35. GRAHAM, M. R., R. F. Ayrey & R. B. Bryson. 2012. Multivariate methods support the Distinction of a new highland Vaejovis (Scorpiones: Vaejovidae) from the Sierra de los Ajos, Mexico. Journal of Arachnology 40: 281-290. AYREY, R. F. 2012. A New Vaejovis from the Mogollon Highlands of Northern Arizona (Scorpiones: Vaejovidae). Euscorpius, 148: 1-12. AYREY, R. F. 2011b. An Anomaly of Pectinal Organs in Vaejovis lapidicola (Scorpiones: Vaejovidae). Euscorpius, 130: 1-6. AYREY, R. F. & M. E. SOLEGLAD. 2011. A New Species of Vaejovis from Prescott, Arizona (Scorpiones: Vaejovidae). Euscorpius, 114: 1-15. AYREY, R. F. 2011a. Serradigitus miscionei (Scorpiones: Vaejovidae). A New Species from Southern Arizona Euscorpius, 111: 1-13. AYREY, R. F. 2009. Sky Island Vaejovis: A New Species (Scorpiones: Vaejovidae). Euscorpius, 86: 1-12. 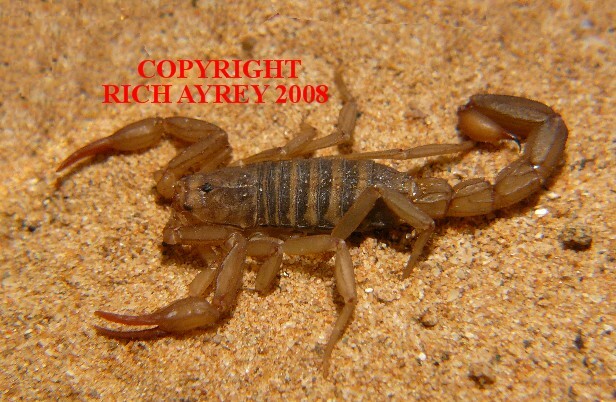 Arizona Scorpion World pages created by Rich Ayrey. �Copyright 2013 -2017 Rich Ayrey. This Arizona Scorpions page created 06/17/2013. This Page Last updated 06/01/2018.